Automation Workshop Free Edition is designed with end user in mind. We have focused to make it as user-friendly and easy to master as possible. Automation Workshop is not merely an automation solution, but a way everyone can automate. That's why it comes packed with many useful features which are fun to use and get the things done. When designing Automation Workshop, we have been looking for an optimum balance between technological sophistication and ease of access. Automation Workshop proudly claims both, allowing to handle even complex Tasks without complication. Intuitive and explicit user interface. Step by step Task Wizard to lead user through the Task creation process. Easy Task backup, import, export and deployment. Powerful Log Manager allows to be in control of automated processes. Effective use of multi-core processors. Context sensitive online help to deliver answers to all your questions. Capacity for long-term unattended operations. A growing set of Triggers and Actions. Flexible workflow designs, Task logic and variables. Automation Workshop packs many industry standard tools that are capable of delivering high performance results and effectively handle even huge workloads. Triggers and Actions are designed and optimized for most common applications, however, can easily handle custom and non-standard automation scenarios. File / folder watcher intelligently monitor file system for all kinds of changes. Task Scheduler runs on basic or advanced schedules. Tasks can be executed upon system startup or shutdown as well as user login or logoff. File operation Actions can do virtually everything with your files and folders. Automatic zip compression and unzip extraction Actions takes care of file archives. Excellent industry standard emailing features will take care of reports and notifications. Variable Wizard allows joining the Actions together and ensure proper their communication. We have tried to minimize the time necessary to learn how to work with Automation Workshop. To grasp the look and feel of the software and get the general idea, try looking at its main components. Triggers · monitor the system and automatically launch the Tasks. Actions · perform the actual operations to bring about the results. Overview · provides general information on important aspects of the software. Screenshots · see the beautiful interface of Automation Workshop. Free download · start your free download now. 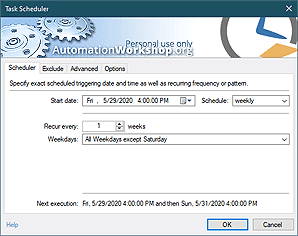 View screenshots · see the user graphical interface of Automation Workshop.